Let's ride! To a new Vanguard! 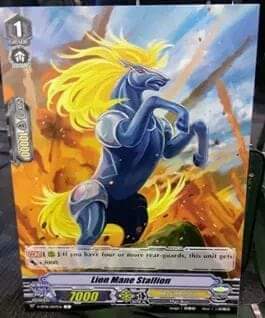 The set's tagline is "Let's ride! 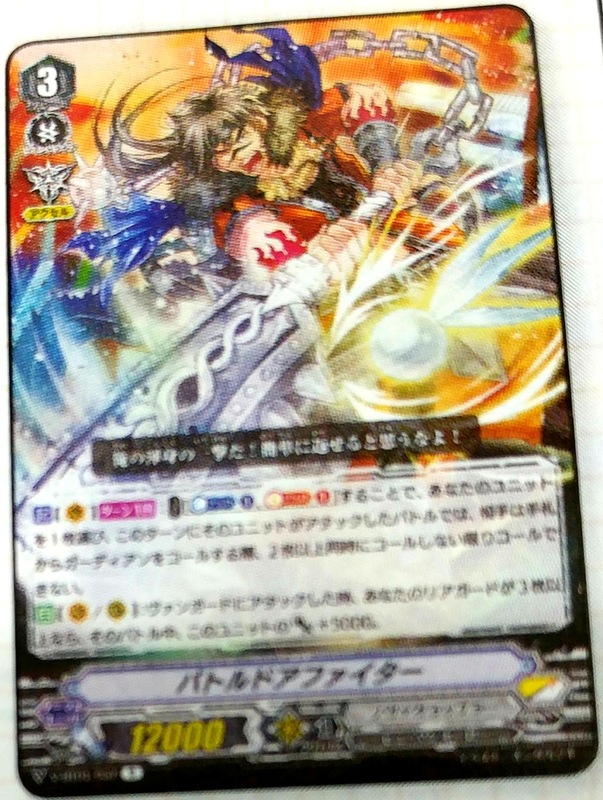 To a new Vanguard!" 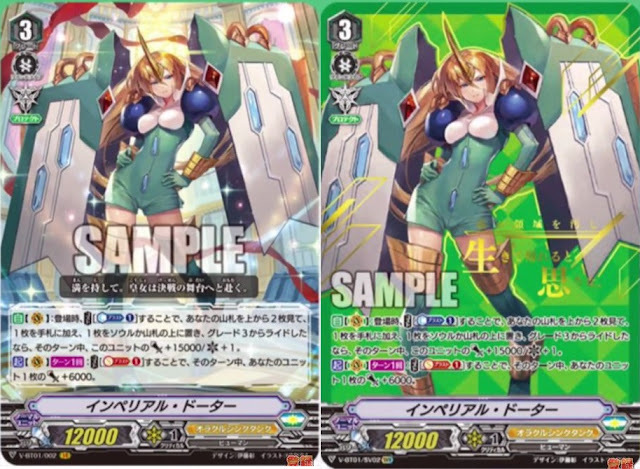 Features cards for Royal Paladin, Kagerou, Oracle Think Tank, and Nova Grappler. 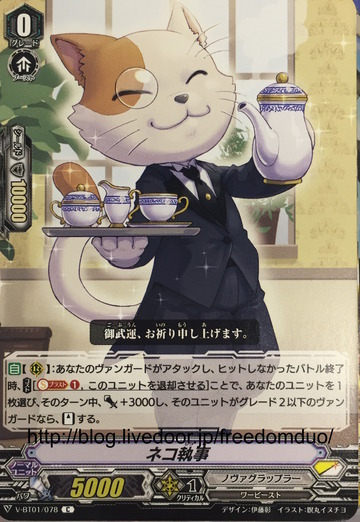 You can build a complete deck for each clan in the set. 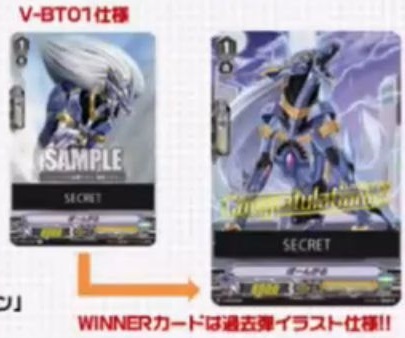 None of the cards in the set are shared with TD01 or TD02. 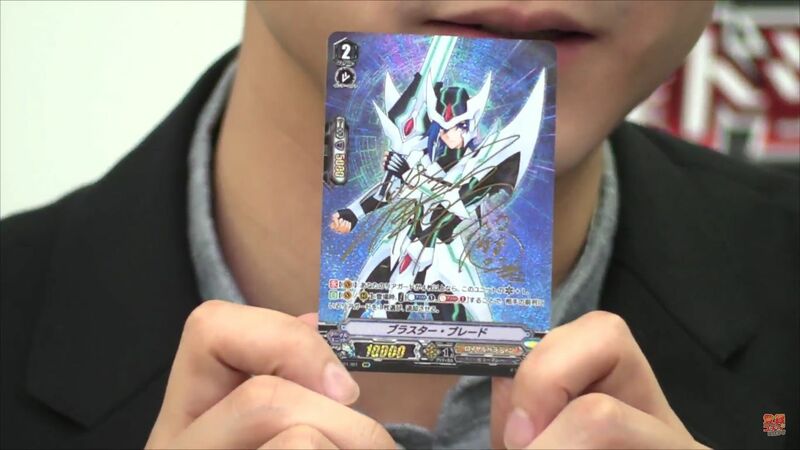 The setlist comprises 84 types of cards; 4 Vanguard Rare, 8 Triple Rare, 12 Double Rare, 17 Single Rare, and 43 Commons. 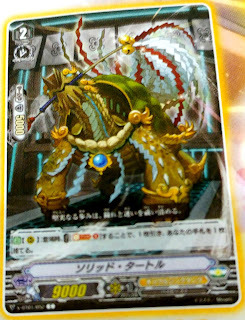 Further features 4 Special Vanguard Rare, 4 Origin Rare, 1 Image Ride Rare, and 4 Secret Rares. 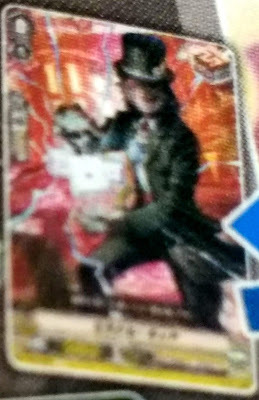 Each pack contains 7 cards, 2 cards in every pack are Single Rare or higher. 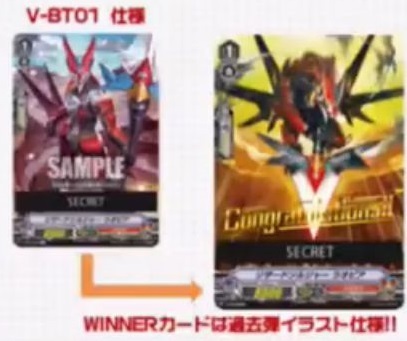 1 display box contains 16 packs. 1 carton contains 20 display boxes. 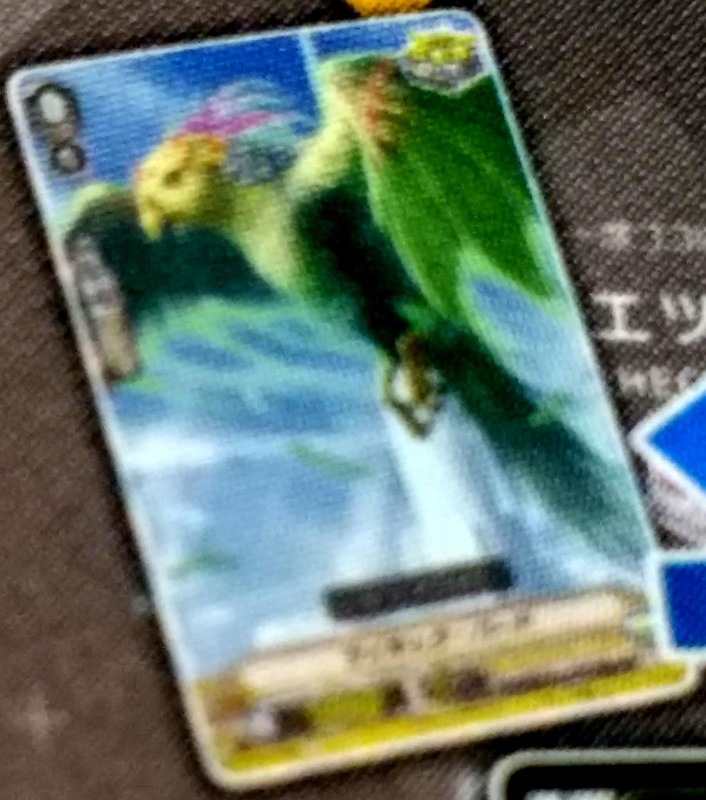 1 carton/case contains 1 Image Ride Rare, 2 Origin Rares, 4 Super Vanguard Rares (1 of each type) 20 Vanguard Rares (5 of each type) 60 Triple Rares (6-9 of each type) and 120 Double Rares. (8-11 of each type.) 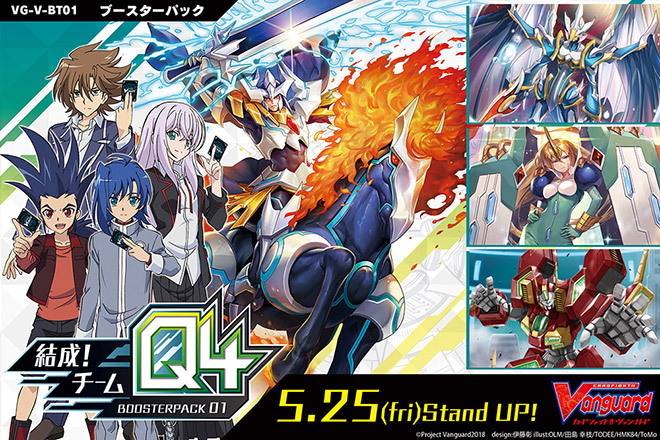 1 booster box/display box always contains 1 Vanguard Rare, 3 Triple Rares, and 6 Double Rares. If the box contains a Super Vanguard Rare, Origin Rare, or Image Ride Rare, it replaces a Common. 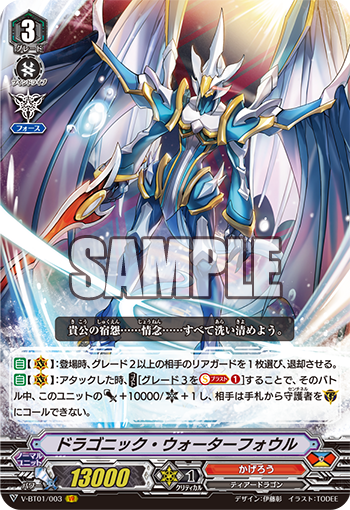 ACT [Vanguard Circle] Once per turn: [Cost: Counterblast 1] Search your deck for up to 1 "Blaster Blade," call it to a Rearguard Circle, and until end of turn, that unit gets Power +5000. 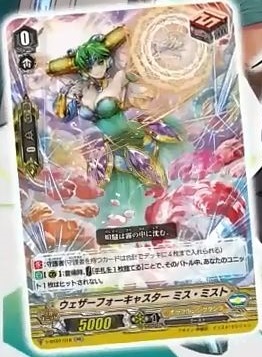 Shuffle your deck. 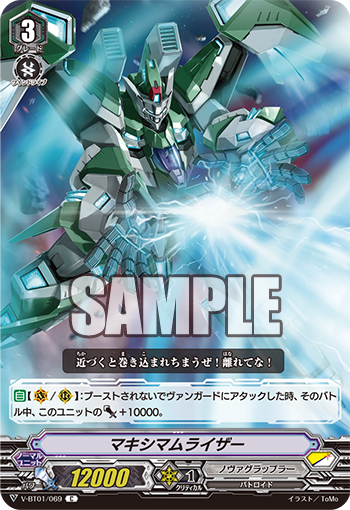 CONT [Vanguard Circle]: During your turn, if you have a "Blaster Blade" on your Rearguard Circle, this unit gets Power +10000. 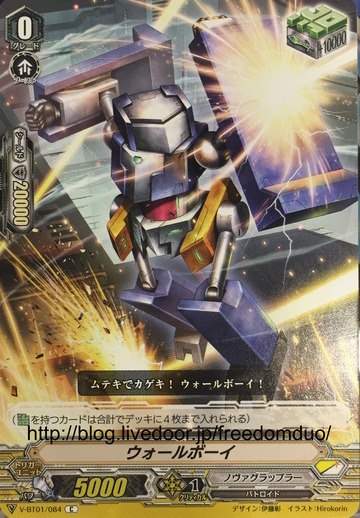 AUTO [Vanguard/Rearguard Circle]: When this unit or your other vanguard is placed, this unit gets Power +10000 until end of turn. Does not possess Imaginary Gift. 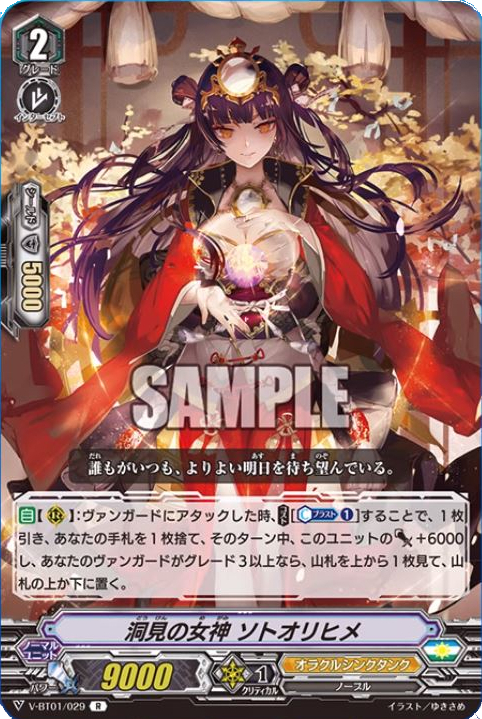 ACT [Vanguard Circle]: [Cost: Soulblast 5] 6 of your units get Power +15000 until end of turn. AUTO [Vanguard Circle]: When it attacks, you may Soulcharge 1. Will be featured as the set's IMR (Image Ride Rare), an illustration of Sendou Aichi as Blaster Blade illustrate by Itou Akira. 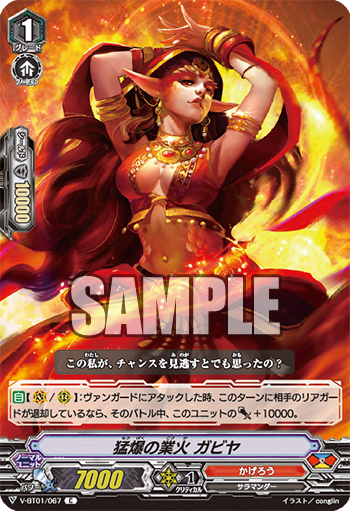 Automatic [Vanguard/Rearguard Circle]: When placed, by paying [Counterblast 1], search your deck for up to 1 "Pongal," call it to Rearguard Circle, and shuffle the deck. 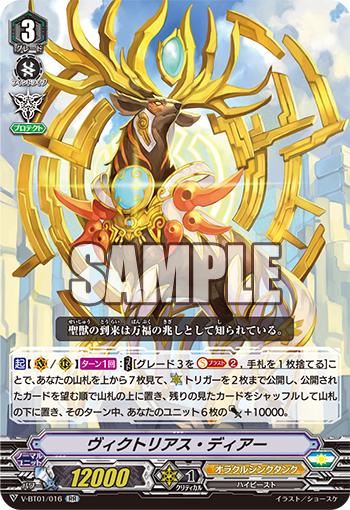 Continuous [Vanguard/Rearguard Circle]: During the battle it is boosted by a <<High Beast>>, this unit gets Power +3000. 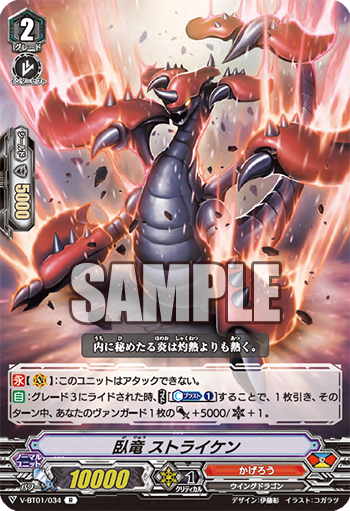 AUTO [Rearguard Circle]: When it attacks a vanguard while boosted, by paying [Counterblast 1], soulcharge 1 and this unit gets Power +5000 until the end of that battle. 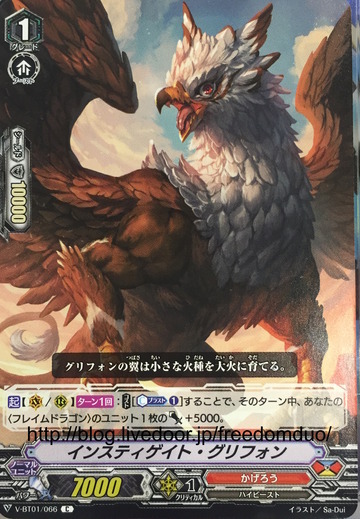 CONT [Rearguard Circle]: If you have five rearguards, this unit cannot be attacked. 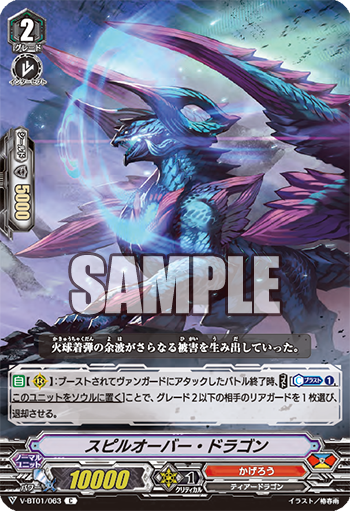 AUTO [Rearguard Circle]: When placed from hand, [Cost: Counterblast 1, Soulblast 1] search your deck for up to 1 grade 2, call it to a Rearguard Circle, and shuffle your deck. 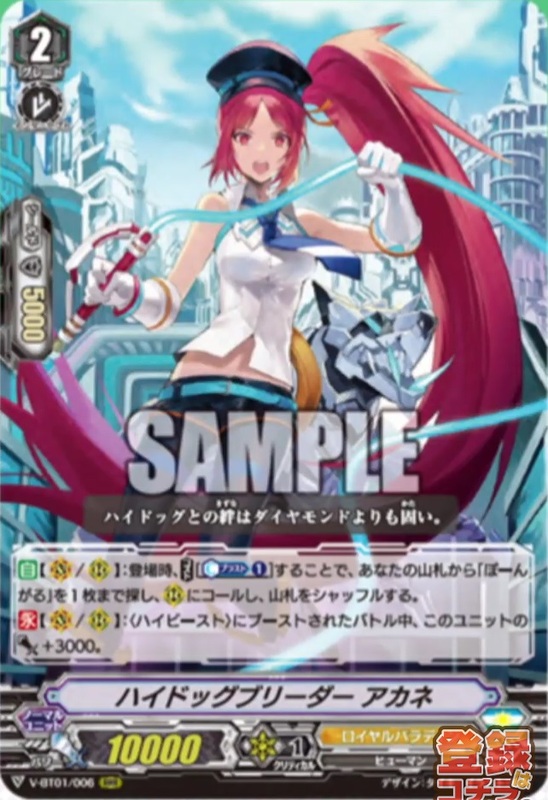 CONT [Rearguard Circle]: If your vanguard is grade 3 or greater, this unit gets Power +3000. 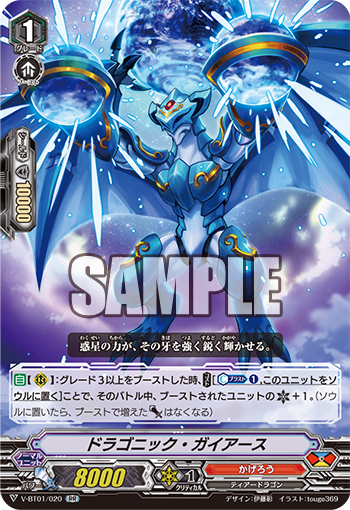 Automatic [Rearguard Circle] Once per turn: When your other rearguard is placed in the same column as this unit, by paying [Counterblast 1], draw 1 card, and during that turn this unit gets Power +3000. 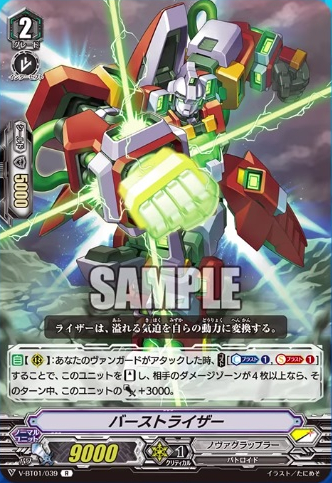 Automatic [Rearguard Circle]: When it attacks a vanguard, [Soulblast 1], and this unit gets Power +3000 until end of turn for each grade of your vanguard. 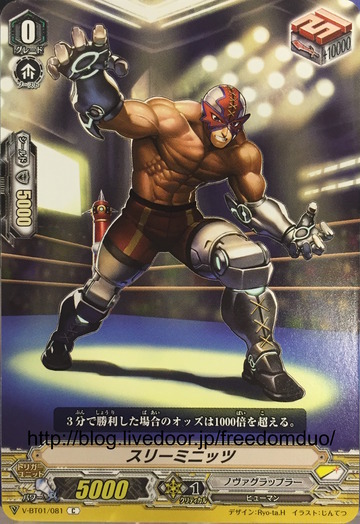 First revealed at Spring Fest 2018. 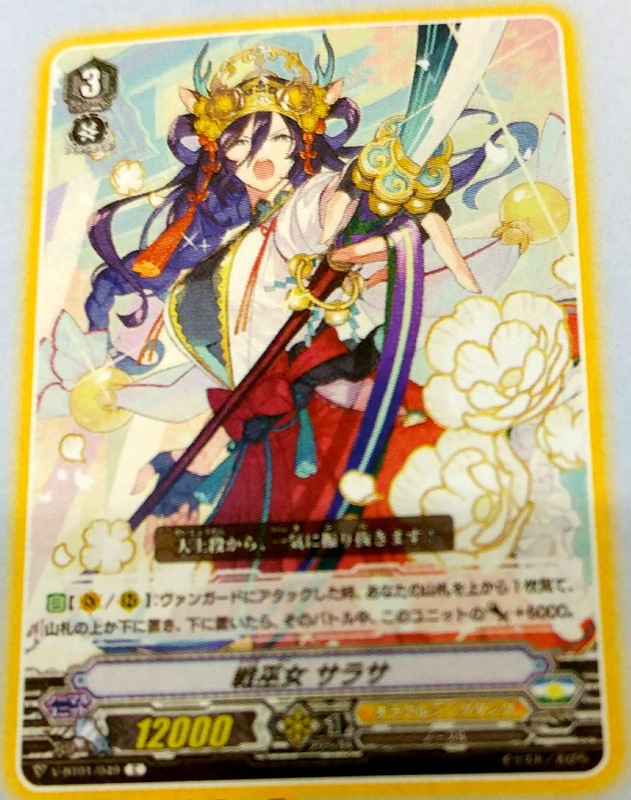 In Japan the effect lasts only until end of battle, not end of turn. 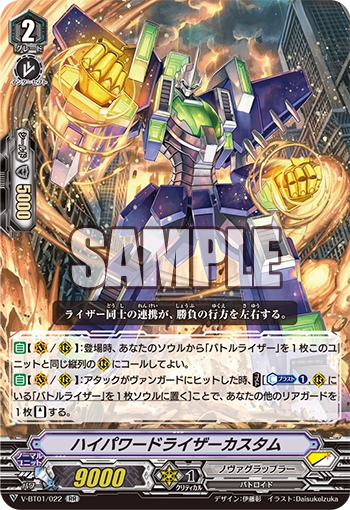 AUTO [Rearguard Circle]: When placed, if you have another unit on the same column as this unit, [Soulcharge 1]. 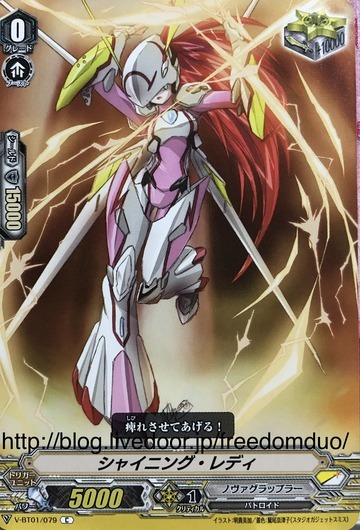 If you soulcharged a Trigger Unit, until end of turn, this unit gets Power +5000. 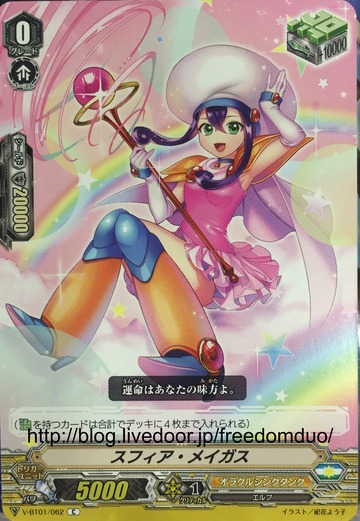 A promo version of this card with Origin Rare-style artwork is being given out to the winners of the Standard and Premium Standard shop tournaments in Japan from 05/01/18~05/31/18. 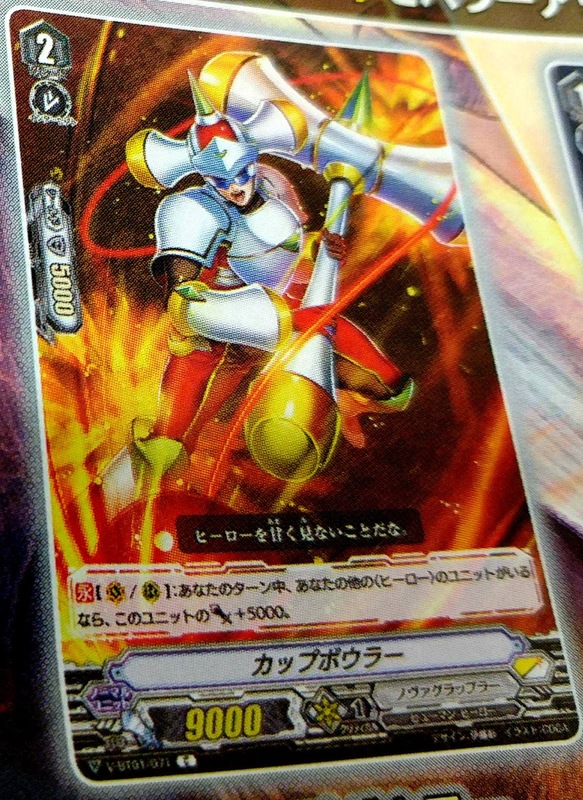 CONT [Rearguard Circle]: During the battle it attacks a vanguard, this unit gets Power +3000. 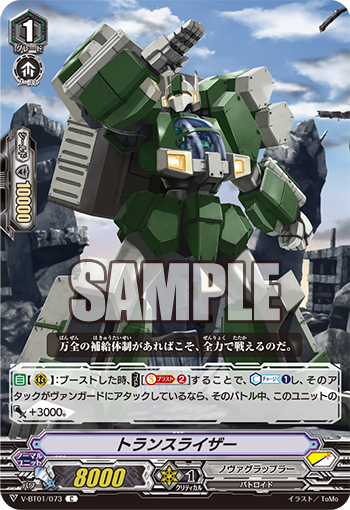 CONT [Rearguard Circle]: If it is in the same column as the vanguard, this unit gets Power +5000. 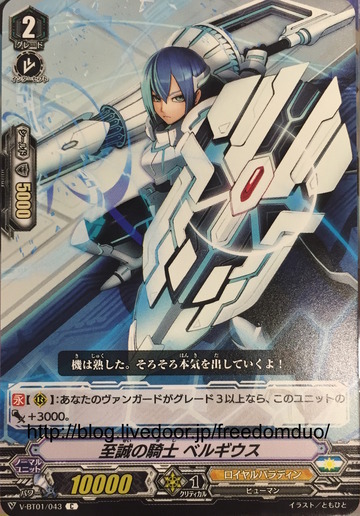 CONT [Rearguard]: If you have four or more rearguards, this unit gets Power +3000. 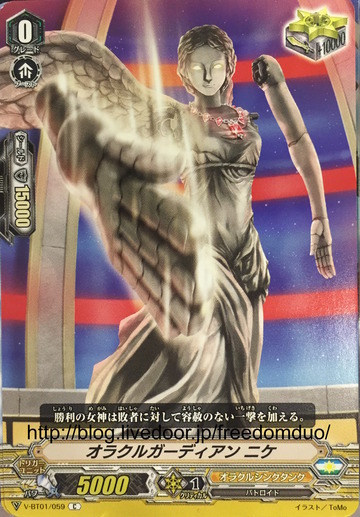 AUTO [Guardian Circle]: When placed, by paying [Discard 1 card from your hand], one of your units cannot be hit until the end of that battle. 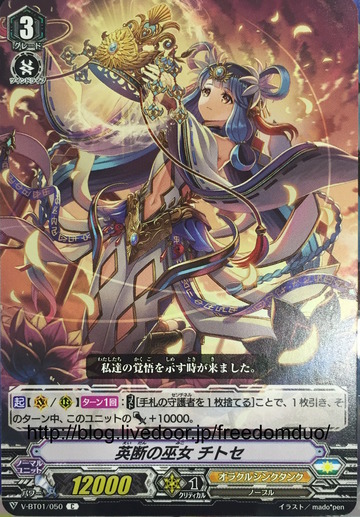 CONT [Rearguard/Guardian Circles] This unit cannot be chosen by your opponent's card effects, and cannot be attacked. AUTO [Vanguard Circle]: When placed, [Cost: Counterblast 1], look at 2 cards from the top of your deck, put 1 of them into your hand, and 1 of them into your soul or on the top of your deck, and if you rode from a grade 3, this unit gets Power +15000/Critical +1 until end of turn. ACT [Vanguard Circle] [Once per turn]: [Cost: Soulblast 1] Until end of turn, 1 of your units gets Power +6000. 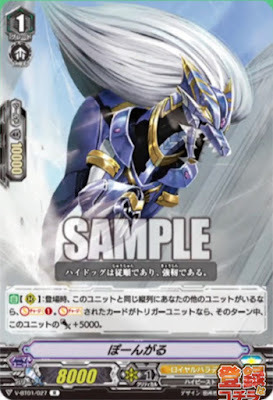 ACT [Vanguard Circle]: Once per turn: [Cost: Counterblast 1] Draw 1 card, look at 1 card from the top of your deck, and put it on the top or bottom of your deck. 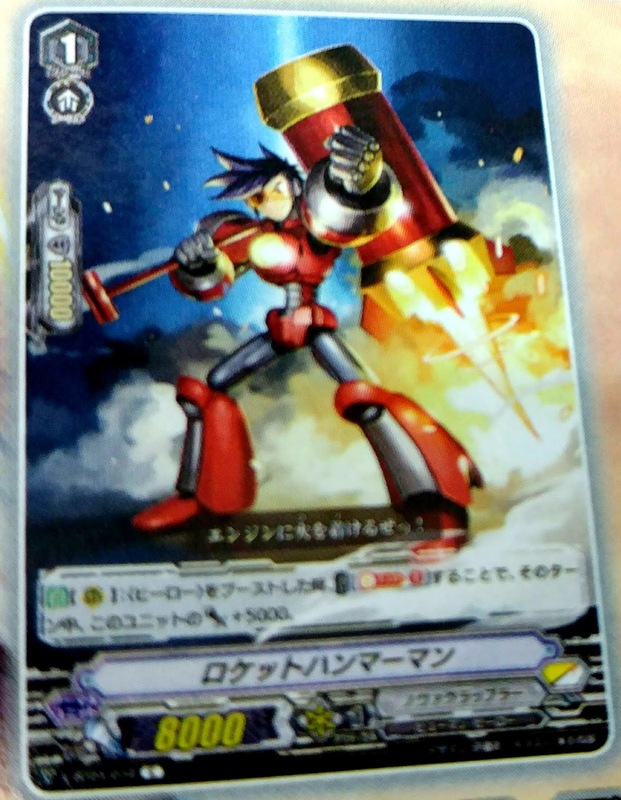 AUTO [Vanguard/Rearguard Circles]: When it attacks a vanguard, look at 1 card from the top of your deck, place it on the top or bottom of your deck, and until the end of that battle this unit gets Power +6000. 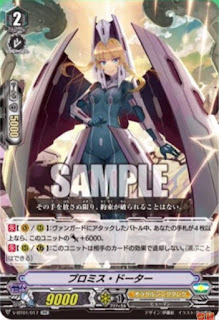 ACT [Vanguard/Rearguard Circles] Once per turn: [Soulblast 2 grade 3 cards, discard 1 card from your hand] Look at 7 cards from the top of your deck, reveal up to 2 Critical Triggers from among them, put the revealed cards on top of your deck in any order, shuffle the remaining cards and put them on the bottom of your deck, and until end of turn 6 of your units get Power +10000. 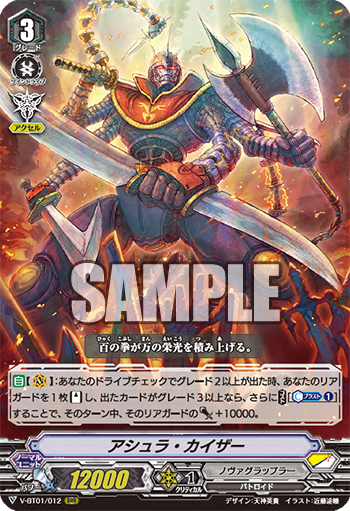 ACT [Vanguard/Rearguard Circles] Once per turn: [Cost: Discard 1 "Sentinel" from your hand] Draw 1 card, and this unit gets Power +10000 until end of turn. 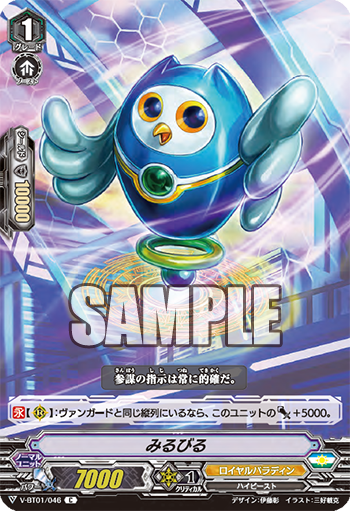 AUTO [Rearguard Circle]: When placed, look at the top card of your deck, and place it on the top or bottom of your deck. 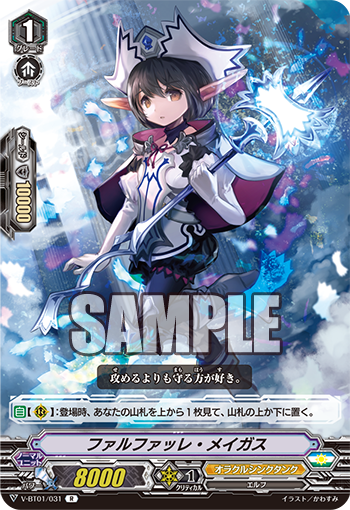 AUTO [Rearguard Circle]: Once per turn: When you draw a card, by paying [Cost: Soulblast 1], this unit gets Power +6000 until end of turn. AUTO [Rearguard Circle]: When placed, by paying [Cost: Soulblast 1] draw 1 card, and discard 1 card from your hand. AUTO [Vanguard/Rearguard Circles]: When placed, [Cost: Counterblast 1] this unit gets Power +6000 until end of turn. 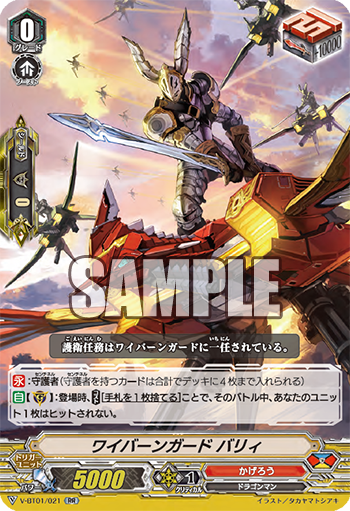 CONT [Vanguard/Rearguard Circles]: During the battle it attacks a vanguard, your opponent cannot call normal units to Guardian Circle. 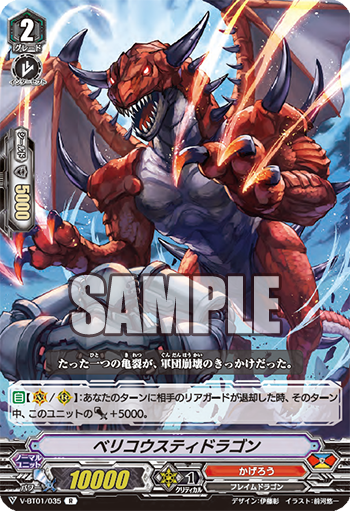 AUTO [Rearguard Circle]: When it attacks a vanguard, by paying [Cost: Counterblast 1], draw 1 card, discard 1 card from your hand, this unit gets Power +6000 until end of turn, and if your vanguard is grade 3 or greater, look at 1 card from the top of your deck, and place it on the top or bottom of your deck. CONT [Vanguard/Rearguard Circle]: During the battle it attacks a vanguard, if the number of cards in your hand is 4 or greater, this unit gets Power +6000. AUTO [Rearguard Circle]: When it boosts a vanguard, if the number of cards in your damage zone is 3 or more, this unit gets Power +6000 until the end of that battle. 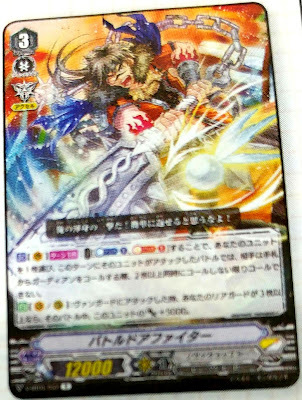 AUTO [Vanguard/Rearguard Circles]: When your vanguard's drive check reveals a grade 2 or greater, you may put that card on the bottom of your deck, and draw 1 card. 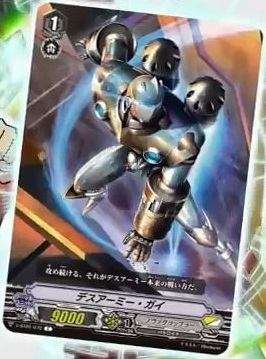 AUTO: When rode upon, [Cost: Counterblast 1] draw 1 card. 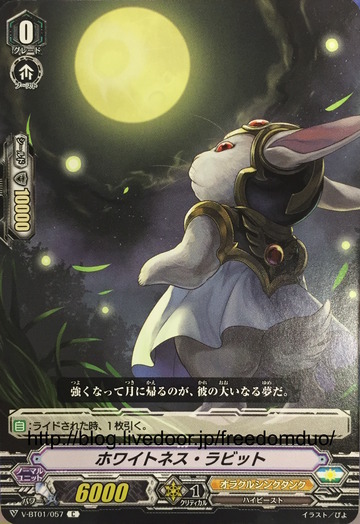 AUTO [Rearguard Circle]: When placed, [Cost: Soulblast 2] draw 1 card, and this unit gets Power +6000 until end of turn. 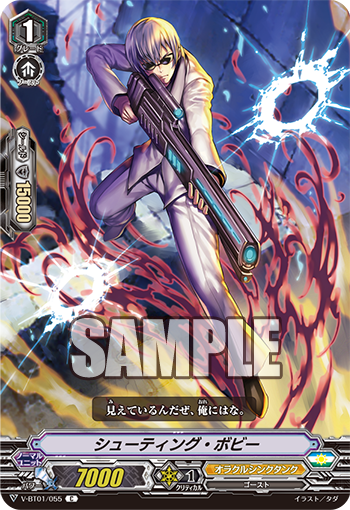 ACT [Rearguard Circle]: If the number of cards in your damage zone is 3 or greater, [Cost: Put this unit into your soul] Countercharge 1. 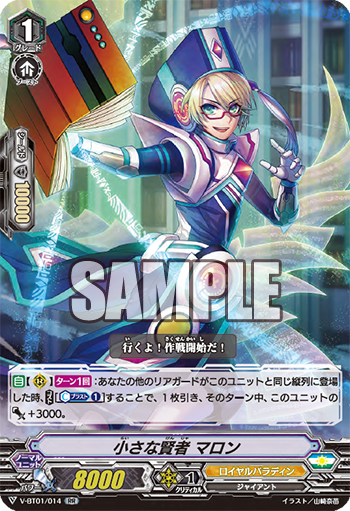 ACT [Rearguard Circle]: [Cost: Put this unit into your soul] Look at 1 card from the top of your deck, and put it on the top or bottom of your deck. 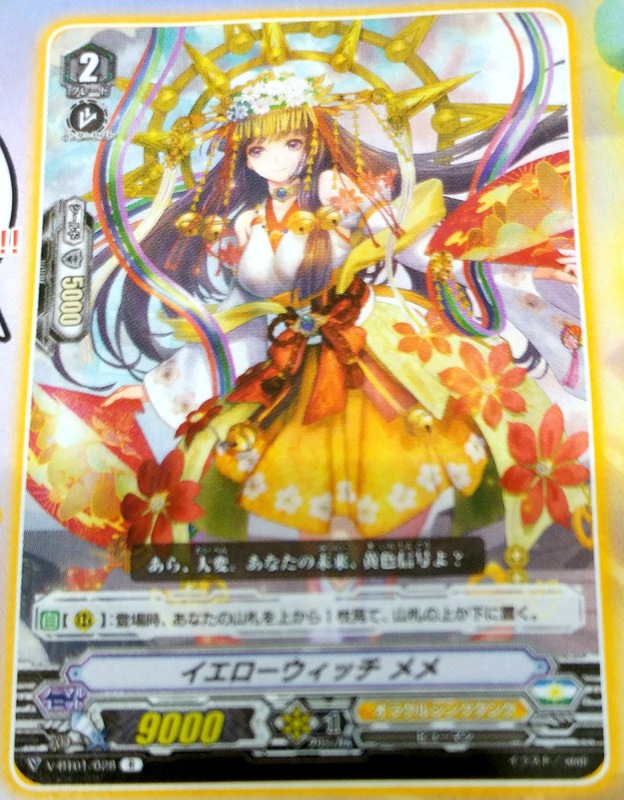 If you put it on the bottom, 1 of your units gets Power +5000 until end of turn. 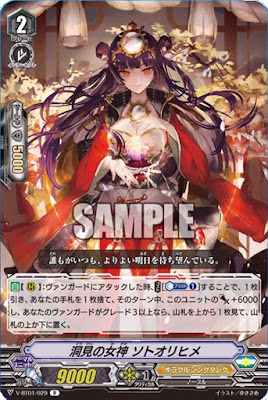 AUTO [Guardian Circle]: When placed, by paying [Cost: Discard 1 card from your hand], one of your units cannot be hit until the end of that battle. 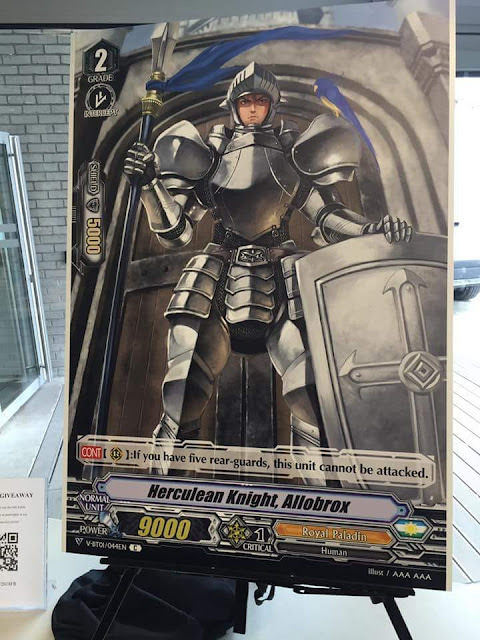 AUTO: When rode upon, draw a card. 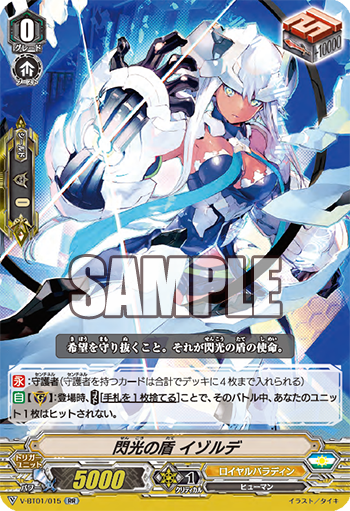 AUTO [Vanguard Circle]: When placed, choose 1 of your opponent's grade 2 or greater rearguards, and retire it. 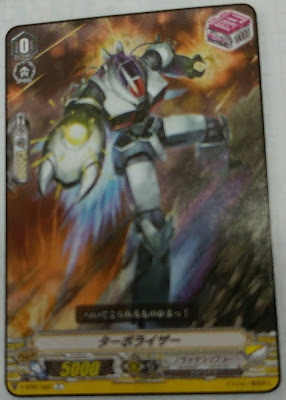 AUTO [Vanguard Circle]: When it attacks, [Cost: Soulblast 1 grade 3 card] this unit gets power +10000/Critical +1 until the end of that battle, and your opponent cannot call cards with "Sentinel" to Guardian Circle from hand. 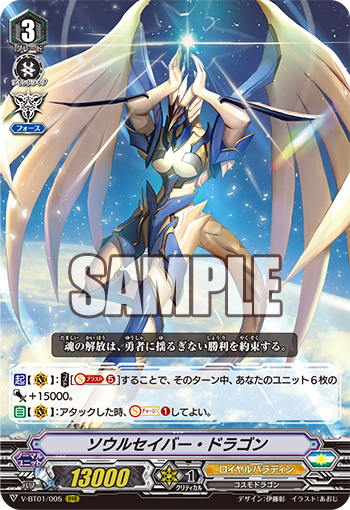 CONT [Hand]: During the turn your opponent's rearguard was retired, you may normal call this unit to Rearguard Circle even if your vanguard is grade 2 or lower. 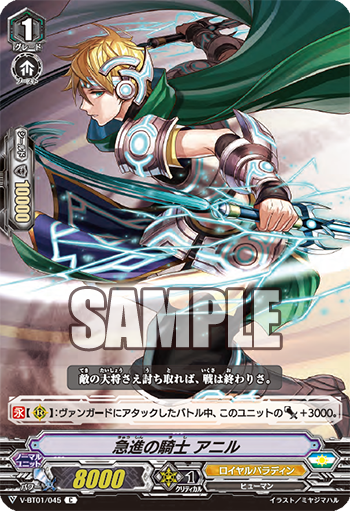 AUTO [Rearguard Circle]: When its attack hits a vanguard, by paying [Return this unit to your hand], you may Soulcharge 1. Does not possess the Imaginary Gift ability. 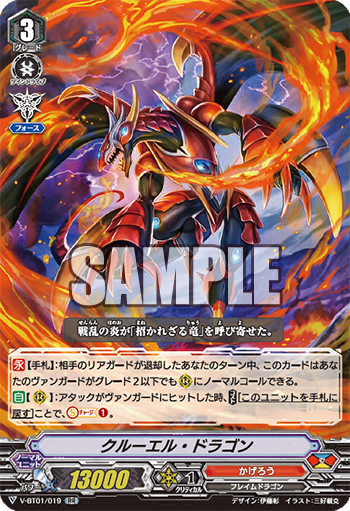 Activate [Vanguard Circle] [Once per turn]: [Counterblast 2] Choose 1 of your opponent's rearguards, retire it, and if you have 5 damage, discard your entire hand and retire all of your opponent's rearguards. 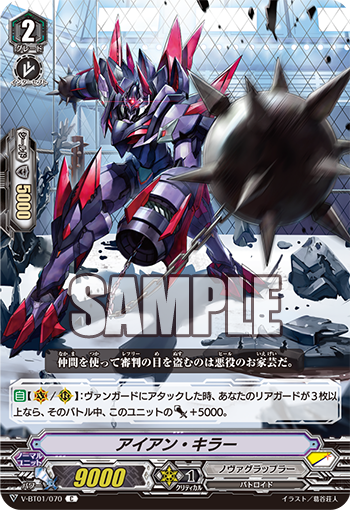 Automatic [Vanguard/Rearguard Circle]: When your opponent's rearguard is retired during your turn, this unit gets Power +5000 during this turn. 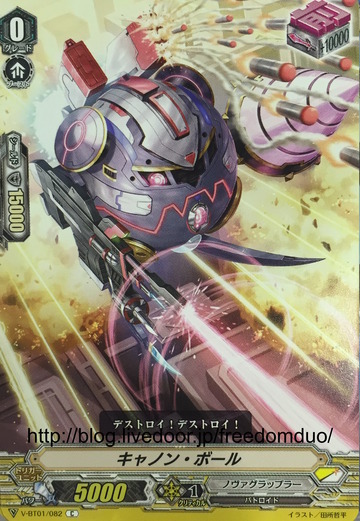 Continuous [Vanguard Circle]: This unit cannot attack. 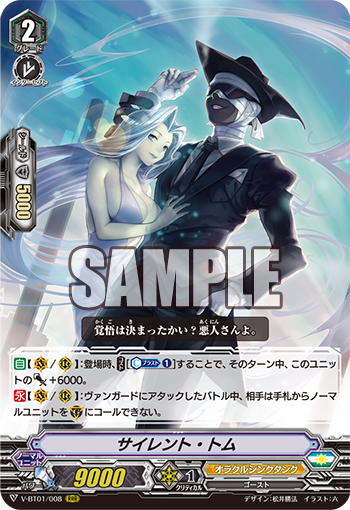 Automatic: When ridden by a grade 3, by paying [Counterblast 1], draw 1 card, during that turn, your vanguard gets Power +5000/Critical +1. 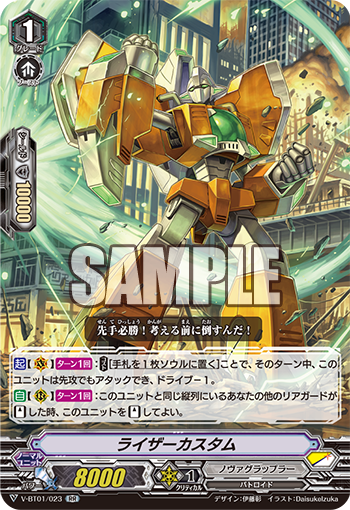 Automatic [Rearguard Circle]: At the end of the battle it attacked a vanguard while boosted, by paying [Counterblast 1, put this unit into your soul], choose 1 of your opponent's grade 2 or less rearguards, and retire it. 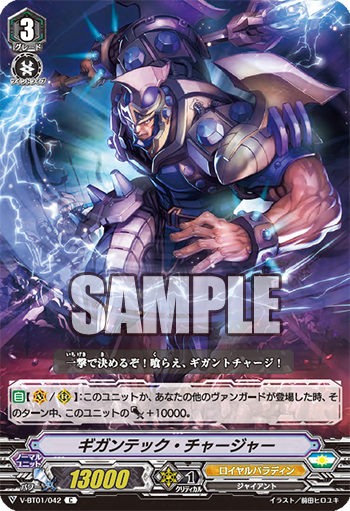 AUTO [Vanguard/Rearguard Circles] When placed, by paying [Counterblast 1, soulblast 1] choose one of your opponent's rearguards, retire it, and if this unit is on the Vanguard Circle, draw 1 card. 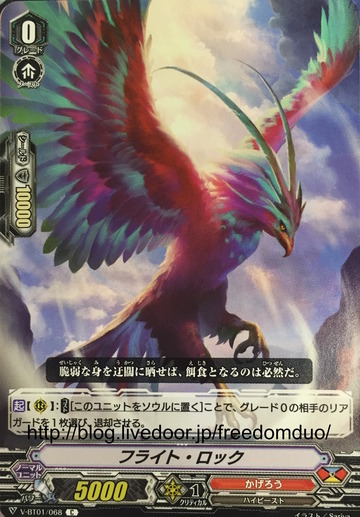 AUTO [Rearguard Circle]: When it attacks a vanguard, if the number of your rearguards is greater than your opponent's during that battle, this unit gets Power +3000. 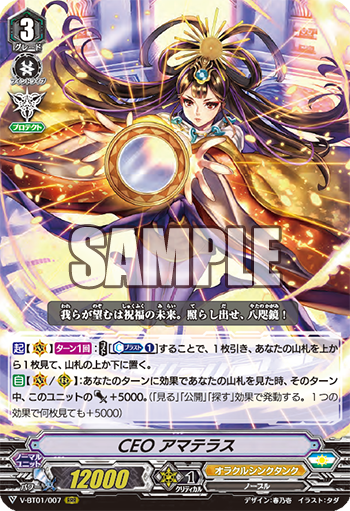 AUTO [Vanguard/Rearguard Circles]: When your opponent's rearguard is retired during your turn, this unit gets Power +5000 until end of turn. 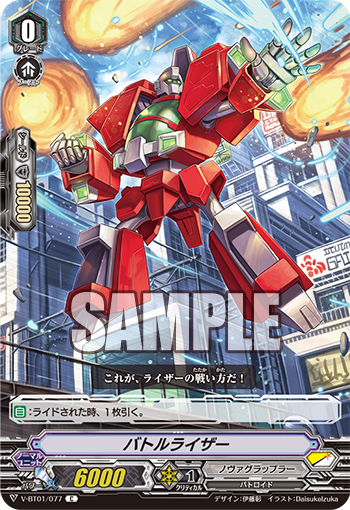 ACT [Vanguard/Rearguard Circle]: [Cost: Counterblast 2] Choose 1 of your opponent's rearguards, retire it, and this unit gets Power +3000. 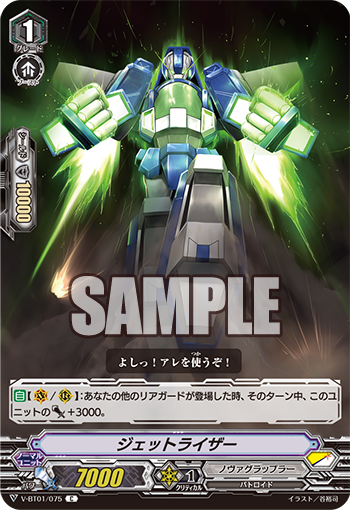 AUTO [Vanguard/Rearguard Circle]: When your opponent's rearguard is retired during your turn, this unit gets Power +5000 until end of turn. 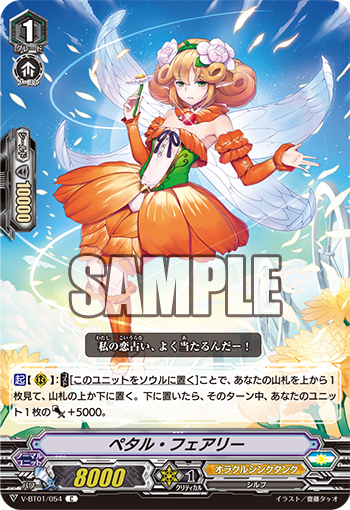 A promo version of this card with Origin Rare-style artwork is being given out to the winners of the Standard and Premium Standard shop tournaments in Japan from 06/01/18~06/31/18. AUTO [Vanguard/Rearguard Circles]: When it attacks a vanguard, if the number of your rearguards is greater than your opponent's, this unit gets Power +5000 until end of battle. 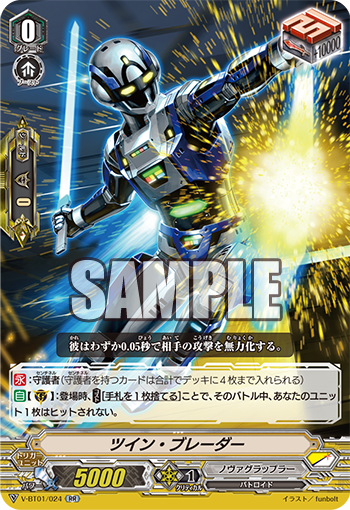 AUTO [Vanguard/Rearguard Circles]: When it attacks a vanguard, if an opponent's rearguard was retired this turn, this unit gets Power +10000 during that battle. CONT [Rearguard Circle]: During the battle it boosts, this unit gets Power +3000. 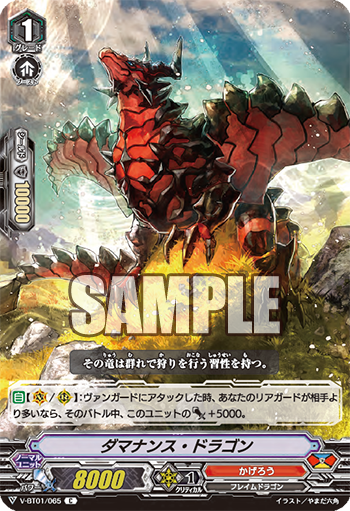 AUTO [Rearguard Circle[: When your opponent's rearguard is retired during your turn, by paying [Cost: Retire this unit], draw 1 card, and Countercharge 1. 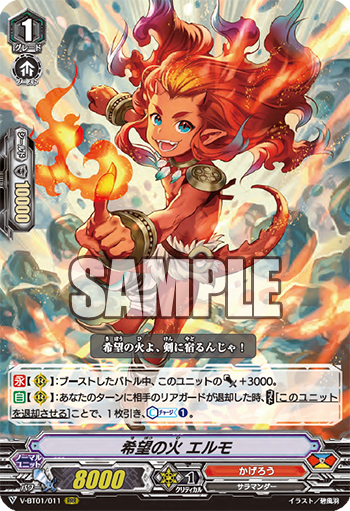 ACT [Vanguard/Rearguard Circle]: Once per turn: [Cost: Counterblast 1] 1 of your <<Flame Dragon>> units gets Power +5000 until end of turn. 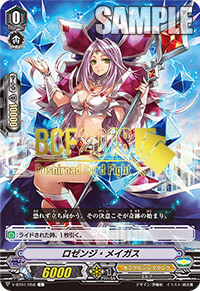 ACT [Rearguard Circle]: [Cost: Put this unit into your soul] Choose 1 of your opponent's grade 0 rearguards, and retire it. 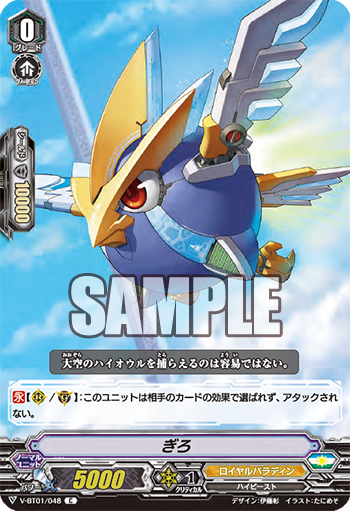 AUTO [Vanguard Circle]: When it attacks, by paying [Cost: Counterblast 2], choose 2 of your front-row rearguards and Stand them. 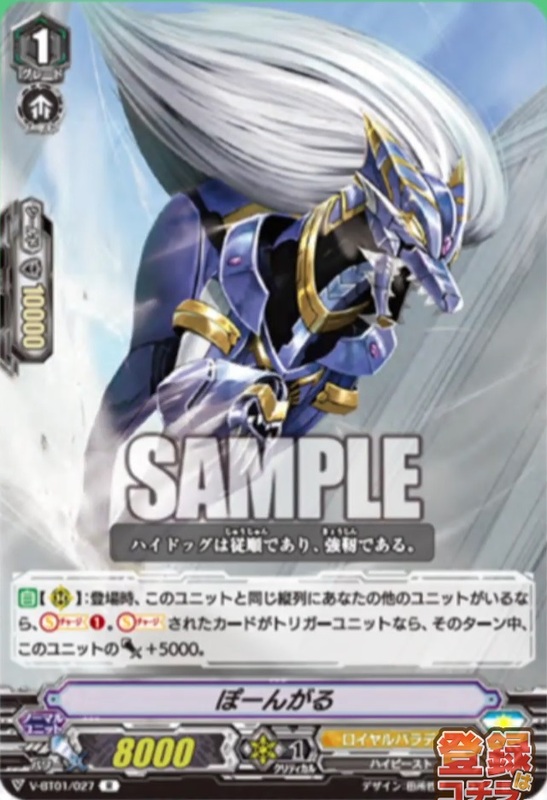 AUTO [Vanguard Circle]: When its attack hits, if you have a "Raizer" card in your soul, Countercharge 1, and 1 of your units gets Power +5000 until end of turn. AUTO [Vanguard Circle]: When your drive check reveals a grade 2 or greater card, Stand 1 of your rearguards, and if the revealed card is grade 3 or greater, by paying [Counterblast 1], that rearguards gets Power +10000 until end of turn. 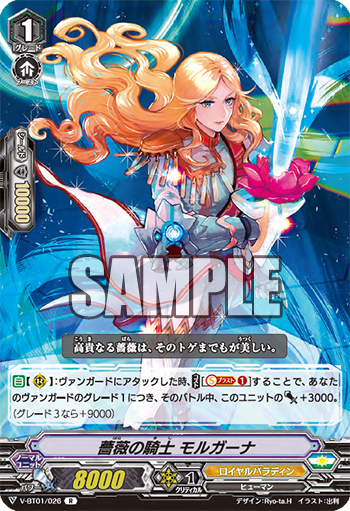 AUTO [Vanguard/Rearguard Circles]: During the battle in which your Hero attacks, your opponent cannot intercept, and if the number of your rearguards is greater than your opponent's, the attacking unit gets Power +3000. 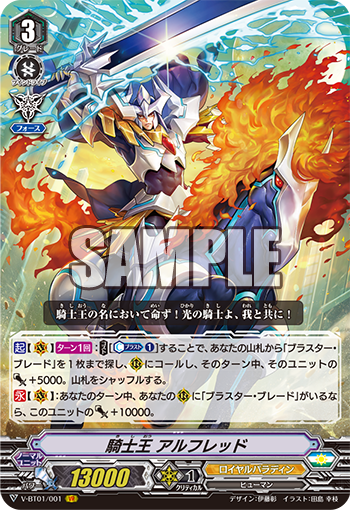 ACT [Vanguard Circle]: Once per turn: [Cost: Counterblast 1, soulblast 1] Choose 1 of your units, until end of turn during the battle when that unit attacks, when your opponent would call guardians from their hand, if they do not call 2 or more guardians, they cannot call. 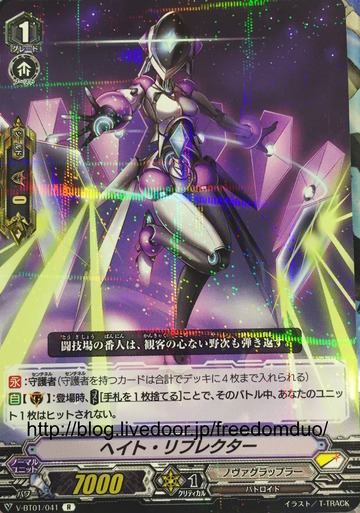 AUTO [Vanguard/Rearguard Circles]: When it attacks a vanguard, if the number of your rearguards is 3 or greater, this unit gets Power +5000 until the end of that battle. 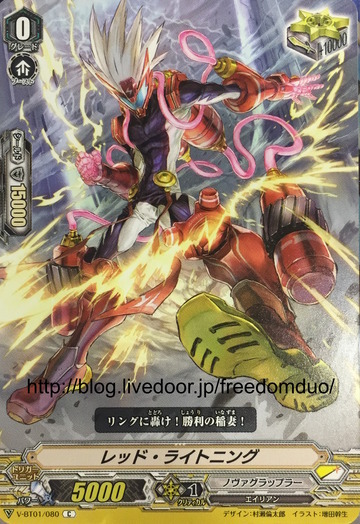 AUTO [Vanguard/Rearguard Circles]: When it attacks a vanguard and is not boosted, this unit gets Power +10000 until the end of that battle. 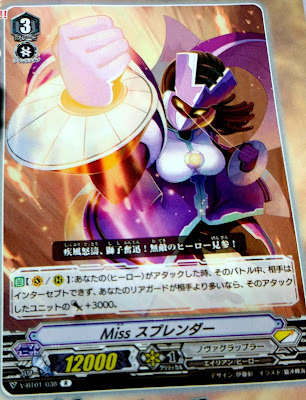 CONT [Vanguard/Rearguard Circle]: During your turn, if you have another <<Hero>> unit, this unit gets Power +5000. AUTO [Rearguard Circle]: When placed, if there are 1 or less face-up cards in your damage zone, Countercharge 1. 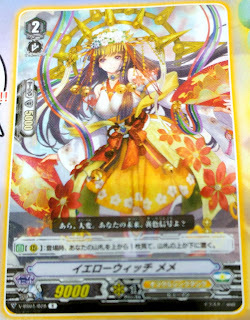 AUTO [Rearguard Circle]: When placed, if you have 1 or less cards in your soul, Soulcharge 1. 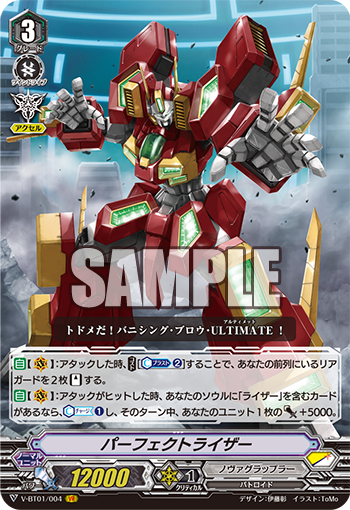 AUTO [Vanguard/Rearguard Circles]: When placed, call 1 "Battleraizer" from your soul to Rearguard Circle in the back row of the same column as this unit. 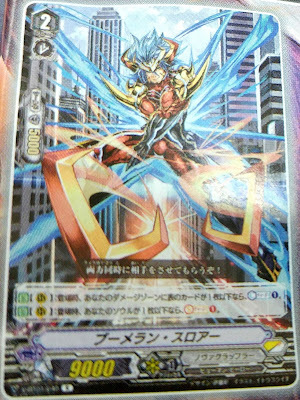 AUTO [Vanguard/Rearguard Circles]: When its attack hits a vanguard, by paying [Cost: Counterblast 1, choose 1 "Battleraizer" on your Rearguard Circle, and put it into your soul] choose 1 of your other rearguards and Stand it. 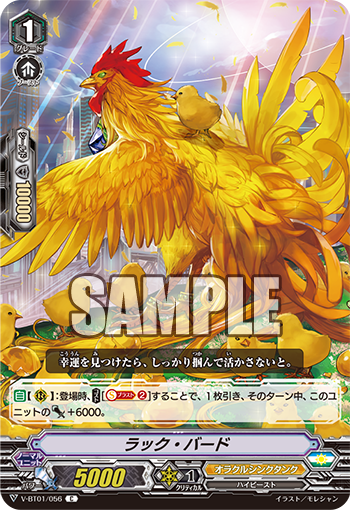 AUTO: [Vanguard/Rearguard Circles]: When it attacks a vanguard, if the number of your rearguards is 3 or greater, this unit gets Power +5000 until the end of that battle. 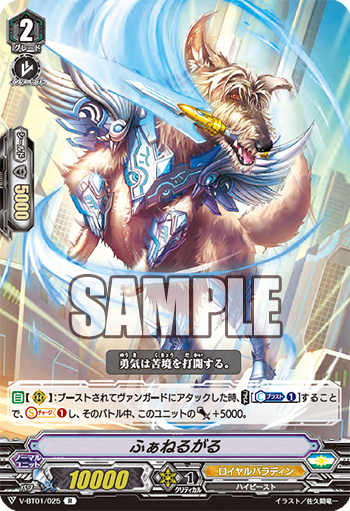 AUTO [Rearguard Circle]: When your vanguard attacks, [Cost: Counterblast 1, Soulblast 1] Stand this unit, and if the number of cards in your opponent's damage zone is 4 or greater, this unit gets Power +3000 until end of turn. 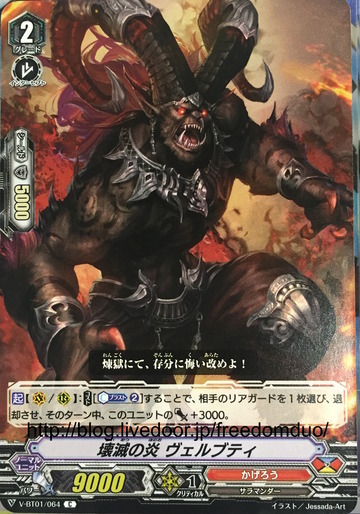 AUTO [Rearguard Circle]: When this unit boosts a Hero, by paying [Cost: Soulblast 1], this unit gets Power +5000 until end of turn. 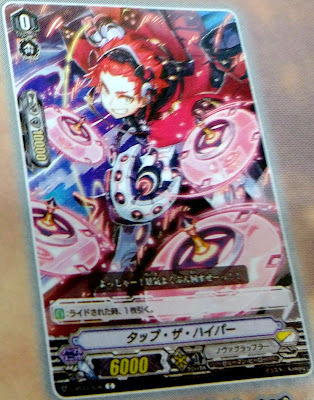 AUTO [Vanguard/Rearguard Circles]: When your other rearguard is placed, this unit gets Power +3000 until end of turn. 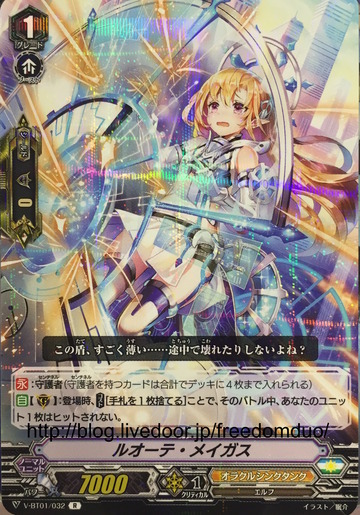 ACT [Vanguard Circle] Once per turn: [Cost: Put 1 card from your hand to your soul] Until end of turn, this unit may attack even if you go first, and gets Drive Check -1. 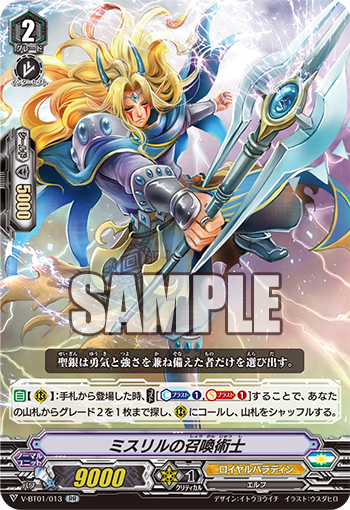 AUTO [Rearguard Circle] Once per turn: When your other rearguard on the same column as this unit Stands, you may Stand this unit. 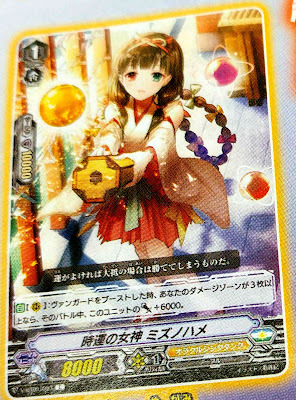 AUTO [Rearguard Circle]: When it boosts. 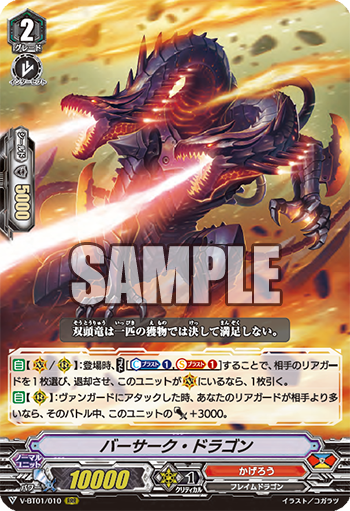 [Cost: Soulblast 2], Countercharge 1, and if that attack targeted a vanguard, this unit gets Power +3000 until the end of that battle. 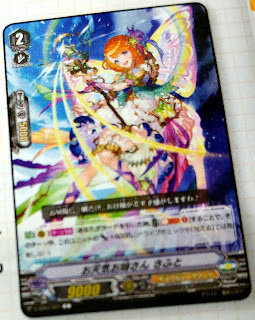 AUTO [Guardian Circle]: When placed, [Cost: Discard 1 card from your hand], and one of your units cannot be hit until the end of that battle. 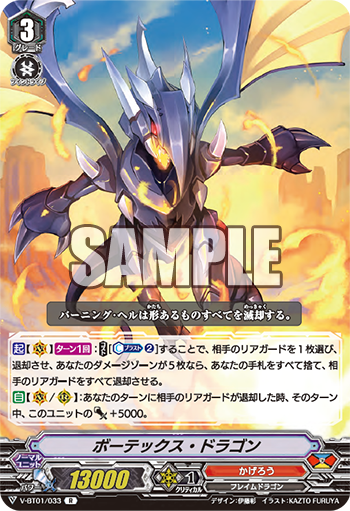 AUTO [Rearguard Circle]: At the end of the battle in which your vanguard's attack did not hit, [Cost: Soulblast 1, retire this unit] choose 1 of your units, it gets Power +3000 until end of turn, and if that unit is a grade 2 or less vanguard, Stand it.